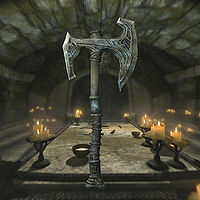 Heddic Volunnar, a Nord who went on an expedition to explore Kvenel's tomb, made a mention of his weapons before tragically being killed in his notes on Volunruud. As the notes reveal, the door to Kvenel's resting place is locked in place, waiting for ceremonial replicas of his signature weapons to open it. Once inside the inner section of the crypt, Volunruud Elder's Cairn, an apparition of Kvenel the Tongue can be found sitting upon a throne. Should he be approached, he will attack, duel wielding the true versions of Eduj and Okin as he presses the assault. If Kvenel's spirit is put to rest again, the two weapons can be recovered from his remains. Killing Kvenel while he is sitting on his throne may make it impossible to recover Okin. You can get Eduj, but when you activate his remains again to obtain Okin, it won't be there. Reloading a previous save to re-kill Kvenel off his throne solves the problem. ?